There are times when moments in art history bubble up to the surface in the new and contemporary. This might be in the form of quotation which, despite our post-modern magpieing, is as old as art itself. At other times it is an echo of the way artists have attempted to express something universal in a manner that is very much their own. 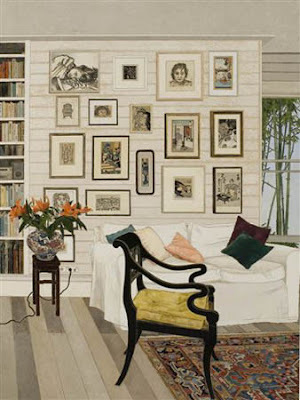 It is in this latter way that we see in Cressida Campbell something of Margaret Preston or Matisse and the clinical eye of every other artist who has tried to say something about our place in the world through the representation of things. 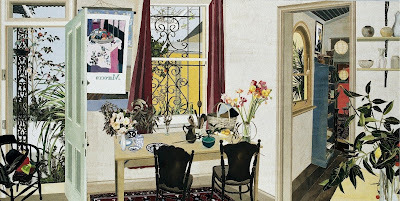 The Cressida Campbell retrospective, in the only place it should be, perched atop Observatory Hill in the S H Ervin Gallery on the shoulder of Sydney's Harbour Bridge, is full of deceptively sophisticated work in those disingenuous genres of landscape and still life. Campbell's practice is interesting. She begins with the image, painting directly onto plywood which when dried, she then etches to, in effect, create a woodblock. To this she applies damp etching paper, creating a negative relief impression which she then paints in watercolour. The result are two mirror images, one in chalky solid tempera on a board, the other in an aqueous ephemeral water colour. The exhibition makes less of this than you might imagine, few pairs of images are juxtaposed and it would have been interesting to look further at how she uses the intersection between design and technique, drawing and colour. Moving through the room is a surprising experience. At times, as in the first monumental vista of Sydney Harbour, the precision and prettiness of some of Campbell's work leads down the path of the chocolate box and my first reaction was disappointment. However deeper in the room you see quite startling and provocative plays with geometry and perspective that reveal a much more compelling art. Campbell's most effective device is to flatten out the perspective to either create almost cubist geometric surfaces or to pull the viewer up flat against the plane of the picture, both effects reward repeated viewing. 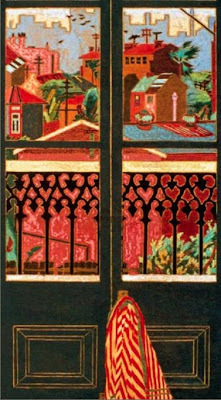 In her images of a 'Chinese Garden, Sydney' she has sucked all the depth out of the frame, leaving geometric overlays, crazed leaded door frames (one is open, distorting the shape further) look out onto the undulating top of a wall, the line of tiles forming a regular wave across the space. The knowledge that she's working in a naturalist style makes the effect of the distorted perspective cognitively stranger, we seek familiar shapes and objects and see them in a fresh light. The mirrored images of 'Interiors with Anemones and Lemons' does something just as immediate, through which it's easy to see how she can be so popular. Here, rather than flattening the depth of field, she appears to design the space from two viewpoints. The scene is that of a sunlit room, the interior going back deep into the space of the picture our own viewpoint quite a way back from the pictorial plane. 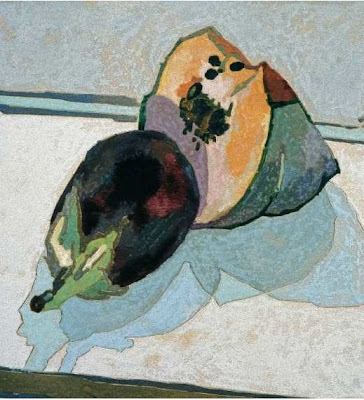 But the second perspective is created by the table on which the lemons and anemones sit, cropped off against the frame of the picture the perspective is almost impossibly high, like we are pressed against the surface of the picture and our point of view is down toward our feet, interrupted by the subject of the still life. This is at once alienating and endearing, we are drawn into and implicated in the picture but it is still very much an image, not illusionistic. These effects combine with a strong sense of the geometry of objects, highlighted in the still life images of tools hung flat against a shed wall and an unpredictable cropping of the image (she often works in shapes and formats that longer and narrower than we might expect) make the experience of her art visually arresting without being gimmicks. Her choice of materials, tempera and watercolour, also help her create something that feels peculiarly Australian. Colour seems bleached from many surfaces, but the palette is that of Sydney, of tin and peeling paint, whitewash and washed in a local light. Resonance abounds, some moments one sees David Hockney's LA portraits (minus the people), at another time a whole history of the Japanese woodblock. These echoes are disparate but there are strings that run through them and that's what gives Campbell's work a quality that rises above the merely picturesque. The modesty of her subject belies the acuteness of her visual sense and craft, making it all the more humane. For that alone we should be thankful. ArtKritique is the secret life of John Matthews. I try to do what I can, to be informed, humanist. educated and independent. It shouldn't be notable but I'm a ticket buying, fee-paying, subscribing kind of critic. That might not be cheap but it does make me furiously independent, and as a bolshie Anglo-Irish, working class, lapsed Catholic, only child I think that's a pretty good place to start.